Has anyone tried something like this in Taiwan or Taiwanese restaurant? 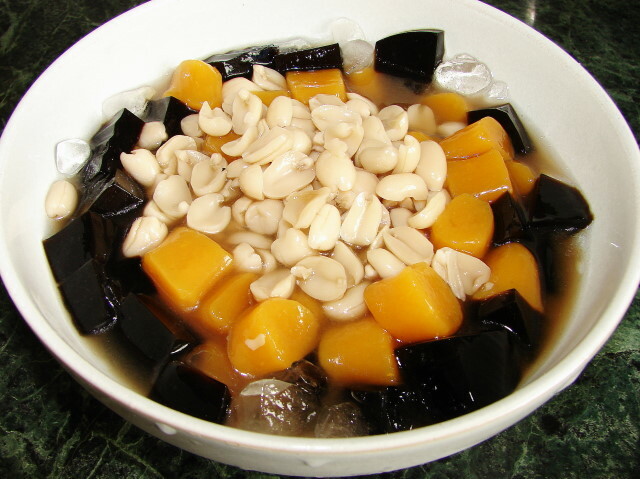 This is a bowl of chewy sweet potato chunks called 'dee kwa yuan 地瓜圓' or 'fun shu yuan 番薯圓', a popular Taiwanese dessert. 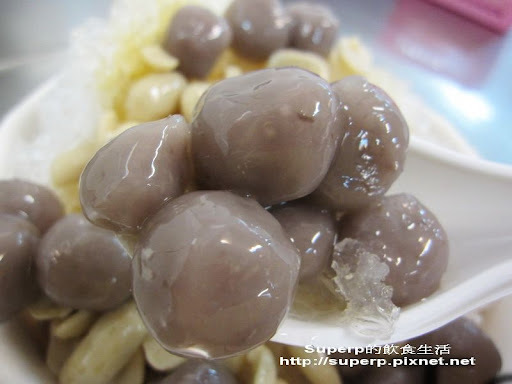 These chunks are similar to Cantonese glutinous rice balls 'tang yuan 湯圓' but much chewier. The first time I made this dessert following a recipe I found on the internet, it was far too chewy for my taste. That recipe and many I found later use too much sweet potato starch to blend with the mashed sweet potato to form a dough, the result I find too chewy unless you like that texture. I prefer a much softer chew. After experiment a few times I blended glutinous rice flour with sweet potato starch/tapioca starch to make them softer to eat and easier to digest. To make this just mix mashed sweet potato with the right type of flours in right proportions it's easy peasy to make. Ingredient: makes 2 cups, enough for 2 - 3 servings. about 250g peeled sweet potato (2 small or 1 medium large sweet potato), you can use any colour of sweet potato, if you can get deep purple ones, that will be quite interesting. 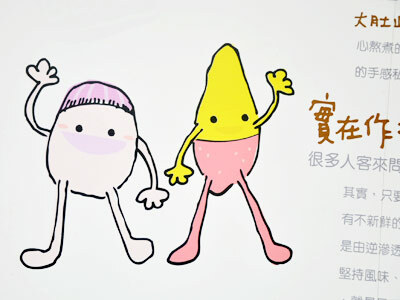 Cut the peeled potato into large chunks. Steam till soft. Leave to cool down for a while. Remove any liquid. Mash as fine as you can. Stir in the sugar. Add in 80 glutinous rice and 75g sweet patato/tapioca starch, stir or mix till dry flour has absorbed and evenly combined. Check the texture of the dough, if too dry add a touch of water if too wet and sticky add some more glutinous rice flour or sweet patato/tapioca starch. Less dry flour/starch added the better, the dough should be soft but not sticky to your hand. Knead till smooth. * Some sweet potato can be dry (floury) and some quite watery when cooked. So use your eyes and hands to feel the texture of the dough. Add more dry flour/starch if needed. More glutinous rice flour the texture will be give a softer chew, more tapioca starch the texture is firmer and chewier. 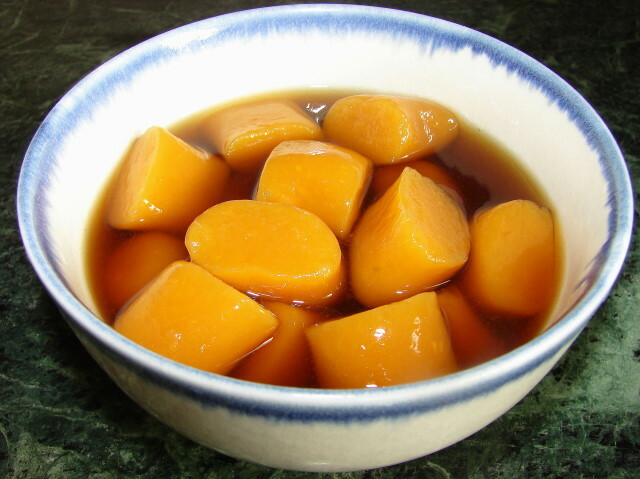 If the sweet potato is watery you may need up to 200g total glutinous rice flour with tapioca starch. Boil a pan of water. When the water is almost boiling, ready to shape the dough. Roll the dough into a 1 - 2cm thick sausage. Cut into small pieces and drop them straight into the rapidly boiling water. Do not cut the dough and leave it aside, they will stick together or stick to the cutting board very quickly. After boiling for about 2 minutes, use a spatula/spoon left up the pieces if they stick to the bottom of the pan. Continue boiling at medium high heat till all the pieces float to the top, boil for a further 3 - 4 minutes if the pieces are quite large (about 3cm wide) and 2 - 3 minutes for smaller pieces. Then they are ready. Take them out and put them in cold water to keep them separate. If you like to serve them warm or hot, dip them in boiling water again before serving. There are many ways to eat this soft chewy chunks, hot or cold. These chunks are softer when hot but will get firmer or chewier if chilled. See picture above I have it with a jaggery goor palm sugar and ginger syrup . Make a syrup with either common brown sugar, Chinese brown sugar sticks, Thai palm sugar, gula Melaka or Indian brown palm sugar (jaggery goor). I like jaggery goor it has a lovely flavour. For the ginger take a chunk and bash it with the back of a large cleaver or anything heavy to bruise it. Put enough water, sugar of your choice and ginger chunks. Boil for few minutes. Sweet potato chunks are best serve hot with ginger syrup. Another way to eat these chewy chunks is to dip the pieces in thick syrup then coat with roasted and finely ground peanuts (peanut powder). This is similar to Malaysian/S'porean dessert called Ais kacang with bits of everything like sweetened boiled beans, nuts, fruits, jelly, tapioca pearls etc., top with syrup, shaved ice/crushed ice, evaporated milk, cream or coconut milk or even a scoop of ice-cream. Anything you fancy. Here is one I made earlier with boiled raw peanuts and black grass jelly more Taiwanese style. I made the chewy sweet potato chunks smaller this time about 1cm thick. To make up the dessert, put some black grass cubes in a bowl, add in some sweet potato chunks and spoon on some boiled peanuts. This can be serve warm or icy cold with some shaved/crushed ice. If you like a creamy taste, you can drizzle on some evaporated milk, light cream, coconut milk or even a scoop of icecream. If you like it sweeter add some syrup, runny honey or even maple syrup. If you have some oriental yam (taro), you can make the similar chewy chunks to go with sweet potato. Taro is drier than sweet potato you will need a lot less dry flour/starch. Something like this and this. 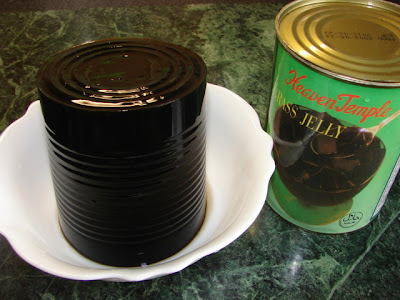 Oh I love black grass jelly! Had forgotten about it. Thanks for the reminder!